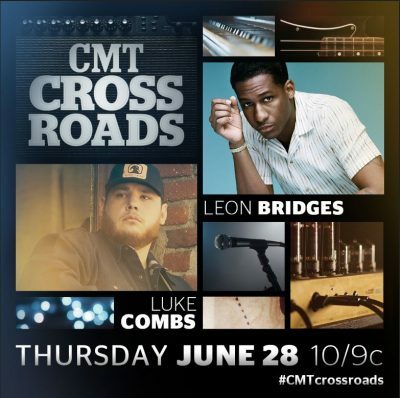 RIVER HOUSE/COLUMBIA NASHVILLE’s LUKE COMBS will join forces with GRAMMY-nominated R&B artist LEON BRIDGES for a special edition of CMT-TV’s “CMT Crossroads” series. The performance is set to take place over Broadway in downtown NASHVILLE for an outdoor concert experience on TUESDAY, JUNE 5th. The free taping is open to fans at 5th and Broadway in NASHVILLE; gates will open at 7p (CT), and the show will begin at 8:30p (CT). The CMT-TV premiere is set to air on THURSDAY, JUNE 28th at 10p (ET/PT). Find the most current Luke Combs tour dates from our partners at Country Music On Tour, your trusted country concert ticket source! Country Music News Blog participates in advertising programs that help fund the operation of this site. For more information please visit our privacy statement. This entry was posted in Luke Combs, Press Releases, Television by Shauna "WhiskeyChick" Castorena. Bookmark the permalink.